Rows of cold frames in England. Building a cold frame is a simple project that is very low cost and is much easier to complete than building a whole greenhouse. The payoff can be great with a variety of cool weather crops to harvest through the winter as well as getting a head start on spring planting. A cold frame is a great season extender that most experienced gardeners won't want to do without. Now that you have your cut pieces of lumber that you either cut yourself or had cut at your lumberyard, you are ready to assemble your cold frame. Assembly is as easy as one-two-three. Set the four pieces of plywood to form a square or open box. With your drill, screw the two-by-two pieces of wood into the corners of your box so that the edges of the plywood are secure with the two-by-twos reinforcing the corners. Paint your box with a white, oil based paint to reflect light inside your cold frame and protect the wood from rotting. Select a sunny area of your yard to place your strcutre. The ideal location will have a southern or western exposure for the most sun in the winter. If you can place it against a building it will benefit from the added protection and warmth.You will need to dig a six-inch trench across where the front of the cold frame will sit. Dig side trenches to create an angle so that the box will be at approximately a 10 percent angle when it is placed on the ground. Make a frame with the two-by-two pieces of lumber. Nail or screw them together. The lid should fit snugly on the top of your box. On sunny days, prop your lid open with a stick or piece of wood to provide ventilation. You don't want to cook your plants! When you are building your own cold frame there are a few other considerations for you to keep in mind. First, if you are building the structure to fit the dimensions of some old windows or for a custom size, make sure that you are able to easily reach across it. Otherwise, you will find it to be more of an irritation than a garden aid. You can really build to any size that you prefer as long as it is convenient to use. The above plan will fit eight standard sized nursery trays of seedlings, but you can customize for your own needs. Secondly, be sure that the soil is well drained. Enhance your soil with compost and peat moss or other organic amendments to enrich your soil while allowing adequate drainage. Thirdly, the sun is your only heat source so if you have a really cold snap, you may want to cover your cold frame with heavy blankets to keep you plants from freezing. Another option is to install a heating cable to create a hotbed. This is usually only needed in very cold climates. One of the biggest benefits of having your own cold frame is being able to harvest lettuce, spinach and other greens all winter long. It is nice to take a break from canned or frozen vegetables and taste fresh picked vegetables as you wait for spring to roll around. Another benefit is the ability to start seeds early indoors and harden them off in the cold frame in early spring. This is a great way to get a jumpstart on your gardening and provides you with an earlier harvest of many of your favorite vegetables. One word of caution though: be aware that slugs will enjoy the warmth of your cold frame too. Keep you eyes open for them so you can keep them under control. You don't want them to eat your lovely winter salad greens! 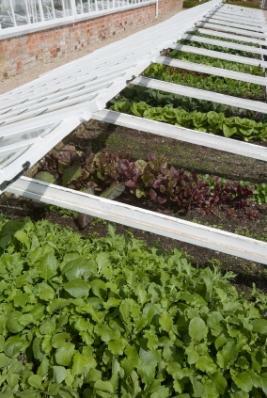 Plan carefully and you can have the best producing winter vegetable garden ever.